Pen to paper; fingers to keyboard. I have started this sentence over about 10 times. The thoughts are there, the words just are not coming to me. You may have noticed that I have been away from Chez Us for awhile. No, we have not stopped eating. Life just kind of grabbed a hold of us or me, and I needed some time to regroup. I think we (I) are back and to kick it off I am inviting to join me with this big bowl of roasted tomato soup. During my break from life, I needed some comfort food. I was sitting, drinking coffee and staring at my computer last week when a childhood memory that I had not thought about floated into my mind….. Campbell’s Cream of Tomato Soup with grilled Velveeta cheese sandwiches. God, I use to love the two; creamy soup and gooey fake cheese sandwiches. I loved how the butter would brown the edges of the bread (white bread, too) and the gooey Velvetta would just ooze everywhere. Now, the soup. Nothing is better than creamy tomato soup but add a pat of butter to it and you have heaven. My grandmother on my father’s side would add a big pat of butter to the soup. I loved watching it bob up and down in the bowl, the edges melting into the creamy soup, leaving little pools of butter. I would slurp up the buttery parts first. Those memories are what I needed to stir up this fantastic soup recipe. I used canned tomatoes, only because the fresh ones are not quite ready yet. As well I threw in a red pepper to give it some added depth. I did serve it with grilled cheese but this time it was on country bread with a spread of French Tapenade and Gruyere cheese. Same buttery edges though! It was delicious. It was comfortable. Did you ever enjoy a Velvetta Cheese Sandwich as a child? Or as an adult? Drain 1 can of tomatoes, reserving liquid. Place tomatoes on a baking sheet with the red pepper. Drizzle with olive oil. Roast for 30 minutes. While the tomatoes are roasting, heat 1 tablespoon olive oil in a heavy dutch oven over low heat. Add the leek and cook over low heat for 10 minutes. Add remaining can of tomatoes, reserved liquid from first can, stock, and thyme, bring to a boil. Lower heat to a simmer and cook uncovered for 30 minutes. Add roasted tomato mixture and any juices that accumulated on the baking sheet. Cook for 15 minutes to combine the flavors. Let cool for 15 minutes. Puree in small batches in a food processor. Return to the dutch oven and gently reheat over low heat. 8 Responses to "Roasted Tomato Soup"
One day this winter I had one of those urges for comfort food from childhood and my heart was set on cream of tomato soup...yes, from the can. When I had none in my pantry I decided to whip some up with canned tomatoes too...skipped the grilled cheese but made some homemade croutons. I will never buy Campbells again...this is too easy and so good I can almost taste it...and the fresh basil a great idea for lightening it up and using my favorite summer herb! 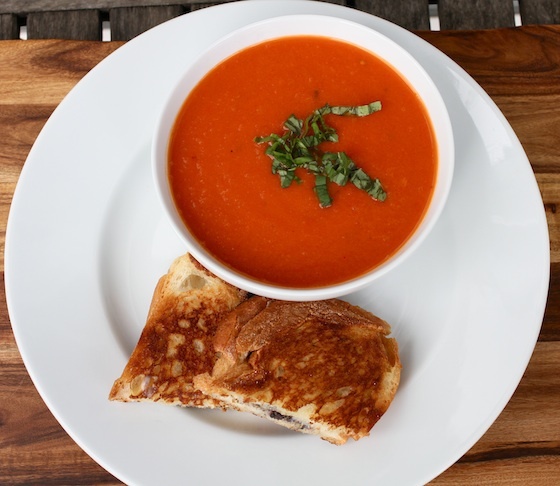 Grilled cheese and tomato soup is the best combination! So making this! Totally with you on getting stuck on a sentence/blog post, there are so many different ways to express how we feel about something close to our hearts but you've done it eloquently! So eloquently that you've made me curious about this whole Velvetta cheese sandwich. Never had it before, but my mom used to just slap two slices of sandwich bread around two slices of Kraft cheese and a strip of ham and seal it in an electric sandwich maker. Delish! Even in our heat here I love tomato soup and toasted cheese sandwich for lunch.